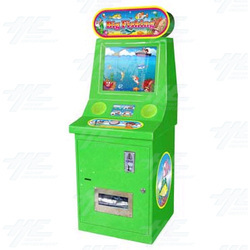 Big Fishing is a ticket redemption game where players insert a coin to 'feed' the fish and lure them into a hook. Once a fish is in the right spot, the player presses a button to hook it. The player then presses the button quickly and continuously to reel the fish in. Tickets are awarded for each fish that is caught. Please Note: This machine can be customised for coin and voltage. Please inform our sales team of your requirements when ordering.